Brett J. Bonner said it best, “It was a magical night in the desert and there will never be another like it.” I was at the Rhythm Room for the first night of recordings that comprise the bulk of Time Brings About a Change…A Floyd Dixon Celebration and it truly was a magical night. I remember offering to buy Amanda Wilson a drink and she said, “No…I’m just right.” We were all just right that night. I’m not a nominator for the BMA awards, but if I was, this is the record of the year. All all-star band to back Floyd Dixon assembled by the musical director for the evening, Kid Ramos, tears into the opening instrumental, Albert Collin’s “Don’t Lose Your Cool,” and everyone in the audience knew they were in for a special night of music. Richard Innes on drums and Larry Taylor on bass kept the back end tight, Troy Jennings on baritone sax and Steve Marsh on tenor played brilliantly, Fred Kaplan opened on the organ and Joe Banks would later bring his trumpet to the party. Johnny Tucker took the stage for the second song, “Do You Wanna Dance,” and stirred the crowd into a frenzy before giving way to the piano stylings of Henry Gray. Then it was star time. Dixon took the stage and led off with “Hole in the Wall.” The sax work by Troy Jennings and Steve Marsh has everyone jumping in their seats while Floyd continues to tickle the ivories. By this point in time Joe Banks has joined the party and lends his trumpet and it all just melds into one beautiful composition. Kid Ramos plays a stirring guitar intro as things slow down on Floyd’s composition, “Cold Cold Feeling.” “I got a cold cold feeling…it’s like ice around my heart” intones Floyd while he teases us with some very intricate keyboard work. Bank’s trumpet work emphasizes the pain of what a cold cold feeling is like and has the crowd clapping in joy. A heartfelt “Time Brings About A Change” is the next song up. Floyd sings with such emotion that you can’t help but feel his pain at having his heart broken by the woman he loves. “Time Brings About A Change” is just a beautiful song by this legendary performer. Dixon moves on seamlessly into one of his greatest hits, “Call Operator 210.” “Hello baby, why did you wait so long to call?” asks Floyd as he relates the story to us. “I’ve been so sick and worried….ever since you left last fall….I’ve been so sick and worried….baby, please come back home!” Guitar fills by Kid Ramos augment the despair felt by Floyd and you know he really loved this woman. The band gets wound up again on “Rita.” “Say I love a little girl named Rita….Rita is the girl for me.” The playing is joyful and upbeat and you know that everyone on stage is just plain having fun. Floyd closes with the classic, “So Long” and it almost hurts to hear it now. Not everyone in the audience, including myself, knew that Floyd was dealing with health issues that would ultimately lead to his death just 55 days later. 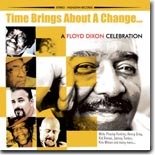 Time Brings About a Change…A Floyd Dixon Celebration is certainly that. A celebration of a wonderful man and pianist who over the years graced us with his presence and his amazing interpretations of the blues. A tremendous amount of credit goes to Robert Auerbach of Highjohn Records for conceiving and supporting the live CD and DVD recordings of this event. Clarke Rigsby did an amazing job capturing everything on tape and along with Kid Ramos and Bob Corritore, produced this amazing recording. This is a record that 20 years from now will still stand the test of time and it’s a wonderful tribute to Floyd Dixon. I am truly grateful to have been there to witness Floyd’s last performances for myself ,and can’t wait for the DVD release of this performance so everyone can share the magic that those of us who were at the Rhythm Room were so privileged to see.